The map below is from the atlas "Joseon-do" (朝鮮圖), which is stored in the Osaka Nakanoshima Library (中之島圖書館). It is believed to have been made sometime in the early 1800s. One of the interesting things about the map is that it shows Ulleungdo (鬱陵島 - 울릉도) with a neighboring island labeled as "Usan" (于山 - 우산). Some Korean historians claim that Usando (于山島 - 우산도) was the old Korean name for "Dokdo" (Liancourt Rocks), but this map and many, many others show that Usando was just a neighboring island of Ulleungdo. The fact that Usando was drawn just off Ulleungdo's east shore strongly suggests that it was present-day Jukdo (竹島), which is Ulleungdo's largest neighboring island and only about two kilometers off Ulleungdo's east shore. 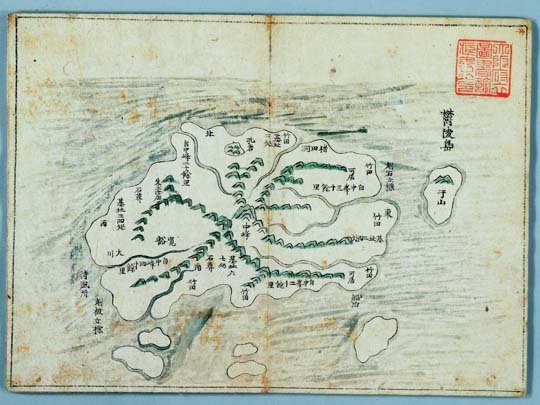 Notice that the above map of Ulleungdo is very similar to the following map of Ulleungdo in the Dongyeodo (東輿圖) atlas, which is stored in the University of Tsukuba Library (筑波大學附屬圖書館) in Japan. The Dongyeodo is believed to have been made sometime between 1795 and 1800. Compare the above maps with the following satellite photo of Ulleungdo's northeast shore. Notice that the location and shape of the small island offshore in the satellite photo is similar to that of the island labeled as "Usan" (于山) on the above maps. The small island offshore in the satellite photo is Ulleungdo's neighboring island of Jukdo (竹島), which is about two kilometers offshore. The above maps disprove Korean claims that Usando (于山島) was "Dokdo" (Liancourt Rocks), which are about ninety-two kilometers southeast of Ulleungdo and are essentially made of of "two" islets, not one. I posted this map from the atlas Joseon-do (朝鮮圖 - 조선도) because I could not find it on this blog. It seems like I posted it before, but where is it? I rembmer this map from Osaka Nakanoshima Library, Japan? You are right,GTOMR. It is in the Osaka Library. I misread the article. I will make the correction. I've updated Japanese Index and it looks like you haven't posted it before. BTW, who is the maker of this map? According to the article to which GTOMR posted a link, the map was made in Korea, probably sometime between 1900 and 1922. It was supposedly taken to Japan, along with 5,237 books and documents, by 佐藤六石 (1864-1927) at the suggestion of Ito Hirobumi. It does not give the name of the actual Korean mapmaker. Yes, I need to update my index, too.